Of all the ways Mary daydreamed returning to Scotland I’m certain being washed up on a beach was not high on her list of preferred methods. There is to be no royal welcome for the Queen of Scots, this is Scotland and whilst she may rule in name she is a stranger in her own country. Washed up and doing a fine impression of drowned rat Mary nearly finds her reign coming to a swift end when a party of men wearing kilts turn up on the beach, not to aid those shipwrecked but to see to it that the survivors don’t make it off the beach alive. Please feel free to join me in my new game. Take a shot every time we see a kilt. If I was you I’d use orange juice not alcohol. Lucky for Mary and Narcisse, who has magically appeared behind a rock ;they have hidden out of sight from the mystery men. Not so lucky for Bash who is next on the chopping block. It’s a good thing then that a second group of strangely dressed fellows turn up and the men in kilts disappear. Narcisse recognises them as druids and remarks on what sort of country Mary rules. The cheek coming from the man who used a dead rat to trick Lola into marrying him. Using identity papers Narcisse has got his hands on, they follow the druids back to their camp where they are holding Bash. They seek refuge with the men and are given food and drink. On the edge of the druid camp stands large wicker man. Narcisse remarks it is for human sacrifice however the druids are nothing but kind to the visitors. The druids explain the wicker man is not used to burn people alive but instead wards off evil and is burnt during the harvest festival to thank their gods for their protection that year. The druid leader remarks to Mary how Scotland is currently divided, the clans are at war and the regent, Mary’s half brother James is despised by many. What Scotland needs is a new face, a ruler who will act as a ‘unifier’. Once Bash has recovered from nearly drowning and they are all well rested Narcisse goes his separate ways. In his time apart it would appear that he had realised he really cares for his wife, Lola. 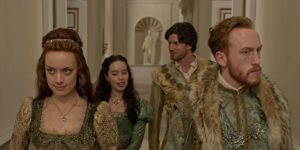 Whilst Narcisse heads off to England, Mary and Bash are given supplies from the druids, the lead druid states he sees the soul of James V in Mary and recognises her as the long seen Queen of Scots. As the druids bid Mary and Bash farewell and good luck on their continued journey towards Edinburgh the camp comes under sudden arrow fire. The kilted clan are back and they are keen on sniffing out all life. Whilst the druids are struck down Mary and Bash use the misinformation about the druids to their advantage. Hiding inside the wicker man Mary presents the identity papers given to get by Narcisse and they claim they are simply a brother and sister shipwrecked from France and taken hostage by the heathen druids. The leader of the clan seems to have taken a creepy liking towards Mary and they insist that they continue to travel with them. It is at this point that Mary recognises the clan insignia, the men in kilts are the very same clan of radical protestants that were involved in the plot to assassinate Mary which led to the tragic death of King Francis. If Mary’s true identity is revealed to the clan MacPhie both her and Bash are in fatal danger. In France both Charles and Claude are still smarting over their mother’s plotting to gain the Regency. Catherine is preoccupied dealing with the threat from the Red Knights so simply informs them that they are to refrain making derogatory remarks about her in public and that they are both to remain safely inside the castle walls. Annoyed as they are, neither wish to take this advice and instead set out to get back at Catherine. So blinded by the want to get back at their mother they play directly into the hands of their enemy. Charles knows he can not simply remove his mother as regent as it undermines his own judgement in the eyes of his privy council and powerful Lords. No to remove his mother from power Charles has decided in his wisdom to prove to his privy council he is of age and fit to rule on his own. To do this he has decided to disobey his mother’s order to remain safe in the castle and to take down the Red Knights himself. Turning into a private investigator and going off on your lonesome to battle great evils seems to be a family trait. Charles is joining Poirot Bash and CSI Claude in the pi club. Of course at his age Charles should be watching a mediaeval version of Dora the Explorer, Charlie the Crusader anyone? Gathering up his group of pre teen ‘spies’ named the Phantom Brigade Charles sets out on his ill thought out plan. Of course the teen boys are hardly well worn in spys, what they are though is the sons of high up dukes and Lords. They are men with the means and connection to gain information to be passed back to the young King. One such member Felix learns of a stockpile of weapons in a small farming community, an odd sight considering there is no need for weaponry there. Charles believes it may be the headquarters of the Red Knights and wishes to follow the lead. It is too dangerous for Charles to go alone but the Red Knights have infiltrated the castle and Charles does not know who to trust. Claude provides an answer in the form if Leith. Loyal to her and his King, Leith will accompany Charles. In return once he is declared sole ruler Charles will grant Leith a Dukedom, once made a Duke Leith would be of sufficient status to marry Claude. Leith worries he will never be good enough to marry Claude and fears retribution from Catherine but agrees to help regardless. Arriving where the stockpile is located in Orsay, Charles and Leith discover gunpowder and emblems of the Red Knights. They decide to return to the castle to recruit more trusted men to carry out a mass explosion that would both destroy the Red Knights weapon stockpile but also draw them out of hiding and straight into the armed men waiting for them. It all seems to be going too smoothly for the young King. These are the same men who have repeatedly outwitted the great schemer Catherine. Leith sensing danger suggests Charles remains at the castle however Charles is having none of it, he is to accompany the merry band of half men. Sending a fiery arrow in the direction of the gunpowder there is an anticlimax when nothing but flames appear. For the uneducated gunpowder plus fire equals big bang. So etching is wrong and instead of falling back as Leith suggests Felix wishes to see what is wrong. Rushing into a burning building is unadvisable but teenage boys don’t have a tendency to think with their brains. All the weapons have mysteriously vanished so it is nothing but grain on fire. As the villagers come out to assess the damage they are less than pleased to see the King’s Guard and King Charles behind the fire. A fight breaks out and Charles is sent back in the direction of the castle for his own safety. Instead of returning to the castle Charles runs into the Red Knights all on horse back. As it turns out one of the spies in training has sold King Charles out. Thierry has led him straight into their grasp. In England Elizabeth is entertaining Prince Magnus of Denmark. Of course she is still not interested in marriage but she is need of resources, there has been an outbreak of hoof(foot) and mouth disease in the countryside. A loss of cattle can be catastrophic for the livelihood and happiness of all affected. Elizabeth needs a solution and rich men seeking wives are often quick to offer favors, so what is a queen to do? Leaving out the small detail of Lola’s own marriage, Elizabeth enlists Lola to play wingwoman and aid her in keeping the Prince’s aid Hans company. Whilst Lola is happy to accompany the good looking Hans, Elizabeth is left hiding her thinly veiled boredom from Prince Magnus, the less attractive of the pair who endlessly states how Denmark is superior to England. Trying to win favour with the Prince Elizabeth shows off the whispering gallery that allows words to clearly be heard from a distance away. Lola suggests Elizabeth can gain Prince Magnus’s affection by playing to his ego,men love to win. Elizabeth herself is highly competitive so dialing it down and letting Magnus win doesn’t come easy to the queen. Out in the courtyard the two couples engage in both mutual flirtation and ego rubbing over a friendly snowball fight. Over dinner Elizabeth’s plan pays off as Prince Magnus offers the queen oxen and other resources that could prevent disaster for England. In return Magnus requires a public proclamation of Elizabeth’s keenest of both Prince Magnus and Denmark. This is the last straw for the Queen who has stayed right lipped in response to the Prince’s arrogance. Dismissing herself she heads out in the direction of the whispering gallery where she is quickly followed by Lola. Alone with Lola Elizabeth let’s rip on the Prince of Denmark but is overhears by Magnus who had came to apologise for any offence. He immediately takes back his offer of help and fathers his men. Whilst Elizabeth is quick to cover herself, once again Lola steps in to help stating that it was her that the Prince overheard not Elizabeth. The Prince immediately bans Lola from Denmark as censure for her remarks, as I’m sure you can gather Lola is heartbroken at this notion. Later Elizabeth approaches Lola to inquire about Lola’s intentions. Elizabeth is aware that as one of Mary’s ladies, her loyalty lies with the Scottish queen and makes it clear that whilst she understands that it is to Lola’s personal gain to get close to Elizabeth she hopes her loyalty to Mary will not stand in the way of a genuine friendship blooming. Upon hearing the news that Mary has landed in Scotland Elizabeth knows that Lola must have overheard the information regarding the navy being temporarily out of service and have passed on the vital information to Mary. Confronting Lola, Elizabeth is strangely calm. Whilst Lola expects Elizabeth to be angry and braces herself for retribution Elizabeth delivers neither. She informs Lola that Mary is likely dead and there are no known survivors. Lola is understandable upset at this news. Instead of being furious at Lola’s betrayal Elizabeth is impressed with Lola’s loyalty to Mary, she holds her loyalty in high regard and merely states that she hopes Lola will remain in England and that Elizabeth herself is in need of friends who are so loyal and devoted to their Queen.